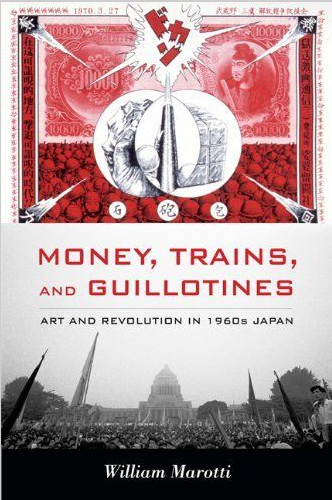 PASADENA — William Marotti will discuss and sign copies of his book “Money, Trains and Guillotines: Art and Revolution in 1960 Japan” as part of the Pacific Asia Museum’s “Authors on Asia” series on Sunday, Oct. 13, at 2 p.m.
During the 1960s a group of young artists in Japan challenged official forms of politics and daily life through interventionist art practices. Marotti, an associate professor of history at UCLA, situates this phenomenon in the historical and political contexts of Japan after World War II and the international activism of the 1960s. The Japanese government renewed its Cold War partnership with the U.S. in 1960, defeating protests against a new security treaty through parliamentary action and the use of riot police. Afterwards, the government promoted a depoliticized everyday world of high growth and consumption, creating a sanitized national image to present in the Tokyo Olympics of 1964. Artists were first to challenge this new political mythology. Marotti examines their political art, and the state’s aggressive response to it. He reveals the challenge mounted in projects such as Akasegawa Genpei’s 1,000-yen prints, a group performance on the busy Yamanote train line, and a plan for a giant guillotine in the Imperial Plaza. Focusing on the annual Yomiuri Indépendant exhibition, he demonstrates how artists came together in a playful but powerful critical art, triggering judicial and police response. 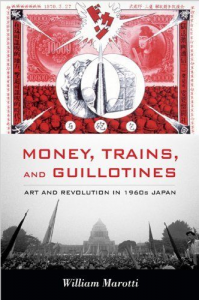 “Money, Trains, and Guillotines” expands our understanding of the role of art in the international 1960s, and of the dynamics of art and policing in Japan. Books will be available for purchase. Light refreshments. To RSVP, call the Museum Store at (626) 449-2742, ext. 20. The museum is located at 40 N. Los Robles Ave. in Pasadena. For more information, visit www.pacificasiamuseum.org.